Weeding through the sea of books that claim to do this, that or the other thing can be time consuming and even frustrating. 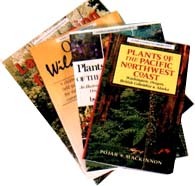 To save you time, energy and $$, we have pre-screened a great number of books on native plants and ecological landscaping ... and present here what we think are the BEST. In some instances, we have searched high and low to find lesser known publications that are the best available for your area. These may include graduate student theses and state or municipal publications that are not available through mainstream booksellers. Peruse away, and let us know if there is a book you like that we have missed. We'll check it out. Also, be sure to check out our Community Service Directory for web-based publications.